What is Lyme disease? What causes Lyme disease? What are risk factors for developing Lyme disease? What are Lyme disease symptoms and signs? What types of doctors treat Lyme disease? What tests do health care professionals use to diagnose Lyme disease? Is Lyme disease curable? What is the prognosis of Lyme disease? What are complications of Lyme disease? Is it possible to prevent Lyme disease? Is there a Lyme disease vaccine? 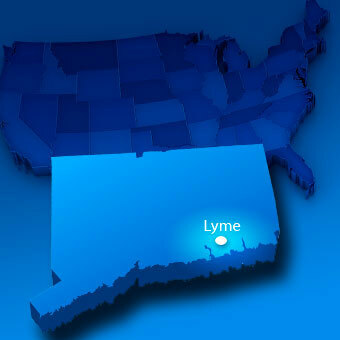 Where can people find more information about Lyme disease? Lyme disease is an illness that is spread by bites from ticks infected by the bacterium Borrelia burgdorferi, Borrelia mayonii, Borrelia afzelii, or Borrelia garinii. Lyme disease can affect the skin, joints, heart, and the nervous system. 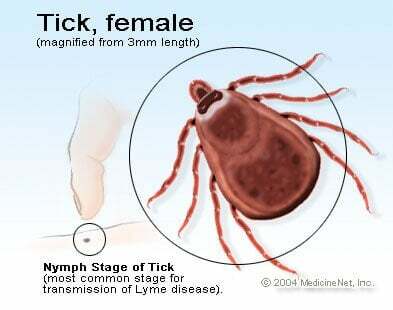 Lyme disease occurs in phases, with the early phase beginning at the site of the tick bite with an expanding ring of redness. Lyme disease is diagnosed based on the patient's clinical signs of illness and the detection of antibodies to the causative bacteria in the blood. A bacterium called a "spirochete" causes Lyme disease, a tick-borne disease. In the United States, the actual name of the bacteria are Borrelia burgdorferi and Borrelia mayonii. In Europe, the bacteria Borrelia afzelii and Borrelia garinii also cause Lyme disease. 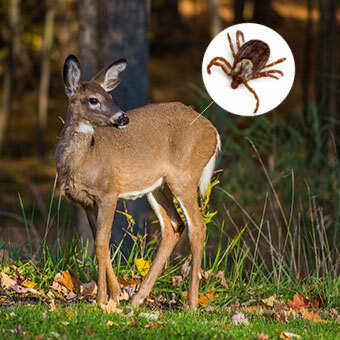 Certain ticks (Ixodes scapularis) frequently found on deer, particularly white-tailed deer, from various locations harbor the bacterium in their stomachs. Dr. Burgdorfer originally discovered the spiral-shaped bacterium in the gut of the ticks in the United States, hence the naming Borrelia burgdorferi. Lyme borreliosis is spread by these infected ticks when they bite the skin, which permits the transmission of the Borrelia spirochete through the skin to infect the body. So Lyme disease is a tick-borne disease. Lyme disease is not contagious from an affected person to someone else. Lyme disease can cause abnormalities in the skin, joints, heart, and nervous system. Borreliosis, a tick-borne disease, is an infectious disease that is reportable to the Centers for Disease Control and Prevention in the United States. Interestingly, the disease only became apparent in 1975 when mothers of a group of children who lived near each other in Lyme, Conn., made researchers aware that their children had all been diagnosed with joint pain from rheumatoid arthritis. This unusual grouping of illness that appeared "rheumatoid" eventually led researchers to the identification of the bacterial cause of the children's condition, what was then named "Lyme disease" in 1982. The only vector for Lyme disease in the U.S. is the black-legged tick, or deer tick, known as Ixodes scapularis. These ticks are carriers of the Lyme disease spirochete in their stomachs; Ixodes ticks may also transmit Powassan virus. The ticks then are vectors that can transmit the bacterium to humans with a tick bite. 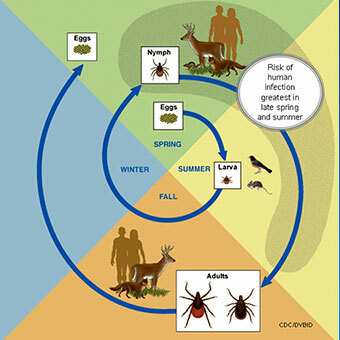 The number of cases of the tick-borne illness in an area depends on the number of ticks present and how often the ticks are infected with the bacteria. In certain areas of New York, where Lyme disease is common, over half of the ticks are infected. Lyme disease has been reported most often in the northeastern United States, but it has been reported in all 50 states, as well as China, Europe, Japan, Australia, and parts of the former Soviet Union. In the United States, it is primarily contracted in the Northeast in the states from Maine to Maryland, in the Midwest in Minnesota and Wisconsin, and in the West in Oregon and Northern California. What those children actually had was Lyme arthritis. Lyme disease occurs most frequently in children 5-14 years of age and adults 40-50 years of age. The most substantial risk factor for Lyme disease is exposure to the ticks located in the high-risk areas of the country listed above, particularly in the New England states, as well as Minnesota and Wisconsin. Additional risk factors include recreational and occupational exposure to ticks and outdoor activities, including gardening, in woods, and fields in the high-risk areas. No transplacental transmission (congenital infection) of Lyme disease from the mother to the unborn child has ever been described. Again, Lyme disease is not contagious from one person to another. Lyme disease affects different areas of the body in varying degrees as it progresses. The site where the tick bites the skin is where the bacteria enter the body through the skin. Days to weeks later, as the bacteria spread in the skin away from the initial tick bite, the tick-borne infection causes an expanding reddish rash that is often associated with "flu-like" symptoms. Later, it can produce abnormalities in the joints, heart, and nervous system. Lyme disease is medically described in three phases (stages) as: (1) early localized disease with skin inflammation and rash; (2) early disseminated disease with heart and nervous system involvement, including palsies and meningitis; and (3) late disease featuring motor and sensory nerve damage and brain inflammation, as well as arthritis. In the early phase of the illness, within days to weeks of the tick bite, the skin around the bite develops an expanding ring of unraised redness. There may be an outer ring of brighter redness with or without a central area of clearing, leading to a "bull's-eye" appearance. This classic initial rash is called "erythema migrans" (formerly called erythema chronicum migrans). Patients often can't recall the tick bite (the ticks can be as small as the periods in this paragraph). Also, they may not have the identifying rash to signal the doctor. The rash may or may not itch. More than one in four patients never even develop a rash. The redness of the skin is often accompanied by generalized fatigue, muscle and joint pain and stiffness, swollen lymph nodes ("swollen glands"), headache, and less often fever, resembling symptoms of a viral infection. The redness resolves, without treatment, in about a month. Weeks to months after the initial redness of the skin, the bacteria and their effects spread throughout the body. Subsequently, disease in the joints, heart, and nervous system can occur. The later phases of Lyme borreliosis can affect the heart, causing inflammation of the heart muscle. This can result in abnormal heart rhythms and heart failure. The nervous system signs can include facial muscle paralysis (Bell's palsy), abnormal sensation due to disease of peripheral nerves (peripheral neuropathy), meningitis, and confusion. Arthritis, or inflammation in the joints, begins with swelling, stiffness, and pain. Usually, only one or a few joints become affected, most commonly the knees. Lyme arthritis can look like many other types of inflammatory arthritis and can become chronic. Researchers have also found that anxiety and depression occur with an increased rate in people with Lyme disease. This is another important aspect of the evaluation and management of this condition. Doctors who are involved in the treatment of Lyme disease include primary care physicians (including pediatricians, family medicine doctors, and internists), as well as specialists in infectious disease, rheumatology, and neurology. In early Lyme disease, doctors can sometimes make a diagnosis simply by finding the classic red rash (described above), particularly in people who have recently been in regions in which Lyme disease is common. The doctor might review the patient's history and examine the patient in order to exclude diseases with similar findings in the joints, heart, and nervous system. Blood tests for antibodies to Lyme bacteria are generally not necessary or helpful in early stage disease, but it can help in diagnosis in later stages. (Antibodies are produced by the body to attack the bacteria and can be evidence of exposure to the bacteria. These antibodies can be detected using a laboratory method called an enzyme-linked immunosorbent assay [ELISA].) Antibodies, however, can be false indicators of disease, since they can persist for years after the disease is cured. Moreover, false-positive tests in patients with nonspecific findings (those that are not specifically suggestive of Lyme disease) can lead to confusion. Currently, the confirmatory test that is most reliable is the Western Blot assay antibody test. More accurate tests are being developed. Both the ELISA test and the Western Blot tests are analyses of blood samples to test for Lyme disease. Generally, Lyme blood testing is helpful in a patient who has symptoms compatible with Lyme disease, who has a history of a tick bite at least a month prior, or who has unexplained disorders of the heart, joints, or nervous system that are characteristic of Lyme disease. Lyme disease is usually curable with antibiotics. This is so true that some authors of Lyme disease research have stated that the most common cause of lack of response of Lyme disease to antibiotic therapy is a lack of Lyme disease to begin with! The type of antibiotic depends on the stage of the disease (early or late) and what areas of the body are affected. 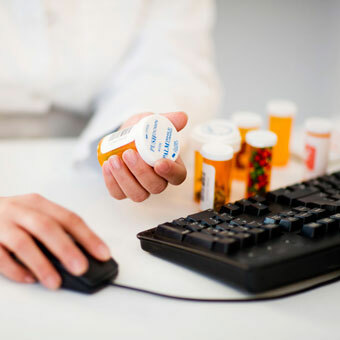 Early illness is usually effectively treated with medications taken by mouth, for example, doxycycline (Vibramycin), amoxicillin (Amoxil), or cefuroxime axetil (Ceftin). This antibiotic therapy generally result in a rapid cure of Lyme disease. Of note, doxycycline should not be used in pregnancy or in children under 8 years of age. 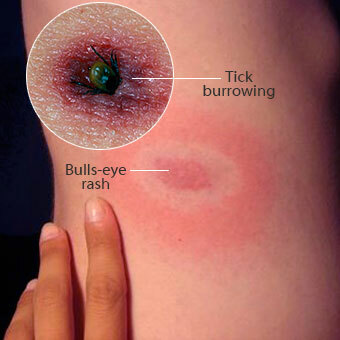 Therefore, if a person finds a typical bull's-eye skin rash (described above) developing in an area of a tick bite, they should seek medical attention as soon as possible. Generally, antibiotic treatment resolves the rash within one or two weeks with no long-term consequences. Later illness such as nervous-system disease might require intravenous drugs; examples are ceftriaxone (Rocephin) and penicillin G. There are no home remedies to treat Lyme disease. In those people with two or more episodes of erythema migrans rash, even years apart, it is felt that the episodes represent different infections or reinfection rather than persistence of the original infection. For relief of Lyme disease symptoms, pain-relieving medicines might be added. Swollen joints can be reduced by the doctor removing fluid from them (arthrocentesis). An arthrocentesis is a procedure whereby fluid is removed from a joint using a needle and syringe under sterile conditions. It is usually performed in a doctor's office. Rarely, even with appropriate antibiotics, the arthritis continues. It has been suggested by researchers that sometimes joint inflammation can persist even after eradication of the Lyme bacteria. This complication has been explained as an ongoing autoimmune response causing inflammation of the joint that was initially stimulated by the original bacterial infection. Oral medications such as ibuprofen (Motrin, Nuprin) can also be used to reduce inflammation and improve function. There is no evidence that nonspecific fatigue that persists after treatment for Lyme disease is related to persistent infection. The risks of prolonged treatments with antibiotics are far greater than any benefit in this situation. 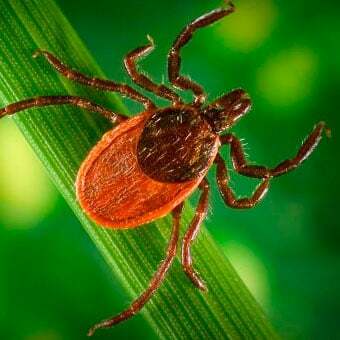 Of note, recent research was done to study whether longer-term antibiotic treatment of persistent symptoms of Lyme disease led to any better outcomes than shorter-term treatment. The study found that longer-term antibiotic treatment did not have additional beneficial effects on health-related quality of life beyond those with shorter-term treatment. Specifically, the researchers determined that this longer-term antibiotic treatment had no more beneficial effect on fatigue, or musculoskeletal, neuropsychological, or cognitive symptoms and disorders from Lyme disease than placebo. Lyme disease can be complicated by permanent damage to joints, the heart, the brain, and the nervous system. There is recent research that demonstrates an increased risk for autoimmune forms of arthritis, including psoriatic arthritis, rheumatoid arthritis, and peripheral spondyloarthropathy, as a result of chronic Lyme disease (or post-treatment Lyme disease syndrome [PTLDS]), even after treatment. Avoiding known tick-infested areas obviously can prevent transmission of Lyme disease. Because ticks transmit Lyme disease by attaching to the body, it is important to use tick-bite avoidance techniques when visiting endemic areas for ticks. Spraying insect repellant containing DEET onto exposed skin can help to keep ticks off of skin and clothes. Wearing long pants tucked into boots and long sleeves can protect the skin. Clothing, children, and pets should be examined for ticks. Ticks can be removed gently with tweezers and saved in a jar for later identification. Bathing the skin and scalp and washing clothing upon returning home might prevent the bite and transmission of the disease. If a person is bitten by the classic deer tick (Ixodes) that has been attached for at least 36 hours, a single dose of doxycycline (200 mg) can be very helpful for prevention of Lyme disease. This therapy is not recommended if the tick is acquired in an area where these ticks are not commonly infested (infection rate less than 20%) with the bacterium (Borrelia) that causes Lyme disease. Also, doxycycline should not be used in pregnancy or in children under 8 years of age. Vaccines for the prevention of Lyme disease were formerly on the market but have not been commercially available since 2002. Further studies of vaccines are needed. For now, ideal prevention focuses on the recommendations above. Berende, Anneleen, et al. "Randomized Trial of Longer-Term Therapy for Symptoms Attributed to Lyme Disease." N Engl J Med 374 (2016): 1209-20.
International Lyme and Associated Diseases Society (ILADS). "Lyme Disease." Infectious Diseases Society of America. <http://www.idsociety.org/Lyme/>. United States. Centers for Disease Control and Prevention. "Lyme Disease." May 27, 2017. <https://www.cdc.gov/lyme/index.html>. Wright, William F., et al. "Diagnosis and Management of Lyme Disease." American Academy of Family Physicians 85.11 June 1, 2012: 1086-1093. <http://www.aafp.org/afp/2012/0601/p1086.html>.